The following is a compilation of the latest Qanon posts. A big thank you to @OrigamiMeme who has provided a ten part analysis of the newest Qanon with pictures. Also a big thank you as always to Louisa from the GoldFish Report who has shared the newest QMAP. 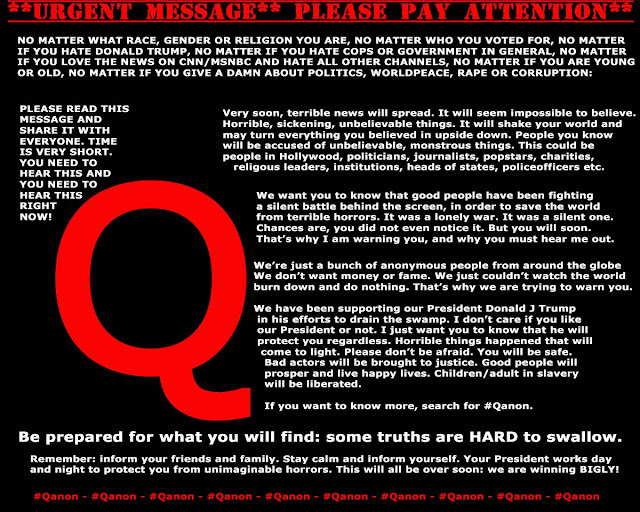 The QMAP is quite detailed with all the red pills needed for the newbie and veteran researchers to continue to share with friends and family. Also posted is a bunch of other Q related postings that are relevant to the current state of affairs such as a new Liz Crokin interview with Sarah Westall. The world is finally uniting and exposing the corruption of the darkness that cowards in the shadows. President JFK, who was murdered by the cowards of the deep state, tried to warn a previous generation of a "ruthless conspiracy" that was taking over the world. Now they are being exposed more than ever. Qanon is helping to wake up the sleeping masses along with countless patriots around the world who are blogging and taking up social media to inform the rest of the world about the coming changes to our reality and White Hat warriors that are defeating of the New World Order/Dark Cabal/Illuminati/Jesuit/Zionist/Satanic/Shadow Cults that seek to rule the world with fear and destruction. Love/Joy/Prosperity/Sovereignty/Freedom cannot be suppressed any longer. Humanity along with Mother Earth have spoken and we will keep moving forward until true Sovereignty is achieved! Part 1: Investigative Journalist Liz Crokin rejoins the program to discuss who Q Anon is what he has been discussing. She also discusses her believes on what the Q Anon strategy is and why the strange operative is in place. We also continue to discuss the disturbing developments in Pedogate and why it is so critical that the masses eventually understand the epidemic that plagues our communities. You can see more of Liz Crokin's Investigative work at https://www.lizcrokin.com/ or https://twitter.com/lizcrokin look for her on Facebook under Liz Crokin.